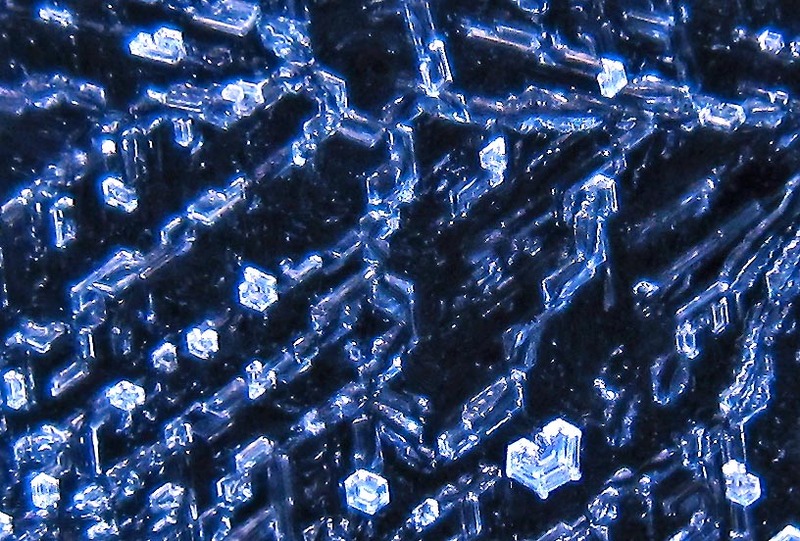 According to Edward LaChapelle’s Field Guide to Snow Crystals (1969), the most widely used classification for falling ice is a system of 10 types from the International Commission on Snow and Ice, which came out in 1951. A few years later, ice researcher Ukichiro Nakaya published a new system with four times the number of ice types. The number doubled 12 years later in 1966 when Magono and Lee published an extension of Nakaya’s system. Of all systems, I think Magono and Lee’s classification of 80 types gets the most use nowadays, so I show it here to help make more people aware of it. To classify a crystal, you simply look at the table below and find the example that most nearly resembles your crystal. This table is a scanned copy of the one in LaChapelle’s book, with some markings cleaned up and a little color added. Click on it to enlarge. For example, the crystal in Mark's Feb. 14 posting is P1c, a broad-branch crystal. The number 80 seems large, but even this system has notable omissions. 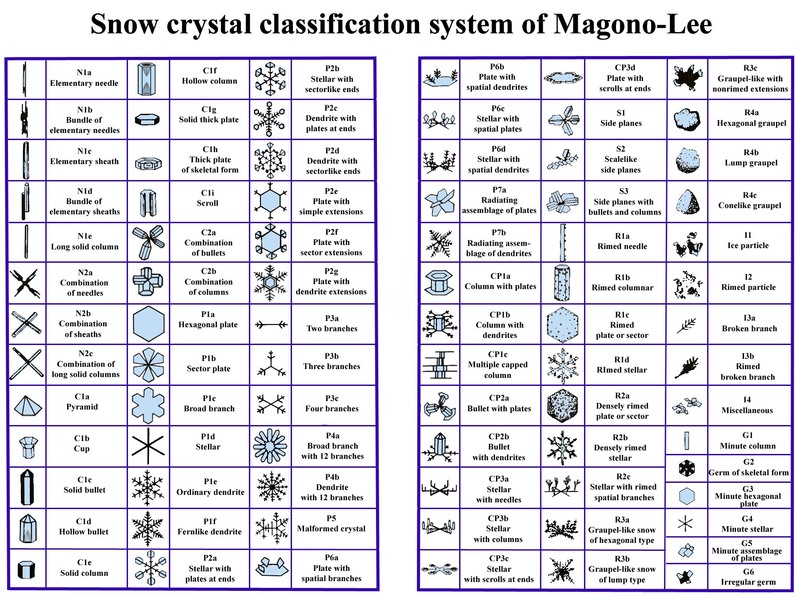 Magono and Lee include graupel (R4a, R4b), which are crystals that collided with many supercooled droplets, but they exclude crystals that collided with and adhered to other crystals. That is, they exclude snowflakes. Other omissions include distinct forms like the spearhead and seagull types as well as sub-divisions of forms they do include; for example, plates like P1a except with unequal sides such as the oft-sited trigonal forms (alternating prism faces are shorter/longer), and hollow columns like C1f except with hollows on all faces. And although they include 12-branched crystals, they don’t include 18 and 24-branched forms. They probably had a good reason for excluding these forms, but it would be nice to have a more complete table for the avid naturalist to refer to. Choji Magono was a professor of geophysics at Hokkaido University in Sapporo Japan, and C. W. Lee was his student. I’ve known about other work by Magono for some time, but I’ve never found any other publications by Lee. I recently asked about Lee to someone who once was a student there, and he told me that Lee returned to North Korea soon after getting the PhD, apparently never to be heard from again. It sounds like a sad ending for a once very promising young researcher. If you can read this Lee, here’s a big thanks for your great dissertation work. Some reviewers of The Story of Snow mistakenly call me the main author. I don't know why they make that mistake - Mark's role as the main author is clearly implied by his copyright on the dedications page and elsewhere. My role was just to check the text and make some suggestions. But I am very glad he asked me to help. In fact, in 2004 I pitched an idea to some publishers that was similar in some respects to, though not as good as, The Story of Snow. My version was fiction. In it, a boy in his yard kicks up a bit of leaf dust, and we track the dust rising through a cloud, eventually to return to the boy's yard as a snow crystal. One publisher expressed some interest, asking me to turn it into non-fiction. I didn't bother. Another way that Mark and I have similar ideas in that we both liken snow to people. In The Story of Snow, the uniqueness of each crystal is likened to our own uniqueness. I have thought about other ways snow resembles people; and in my background write-up for the Junior Library Guild, I mentioned some of them. Inspired by some of the nice science essays I read in the New York Times, I developed these resemblances into a little essay and submitted it to them. It didn't make the cut, but I think you might enjoy it. Here it is. The silently falling snow crystal can vanish in one’s breath, yet can build up into glaciers that carve mountains. Individually weak yet collectively strong; people are like that too. And if we look deeper into the little flake’s tumble from the clouds, we may see even more parallels to ourselves. Consider its birth. 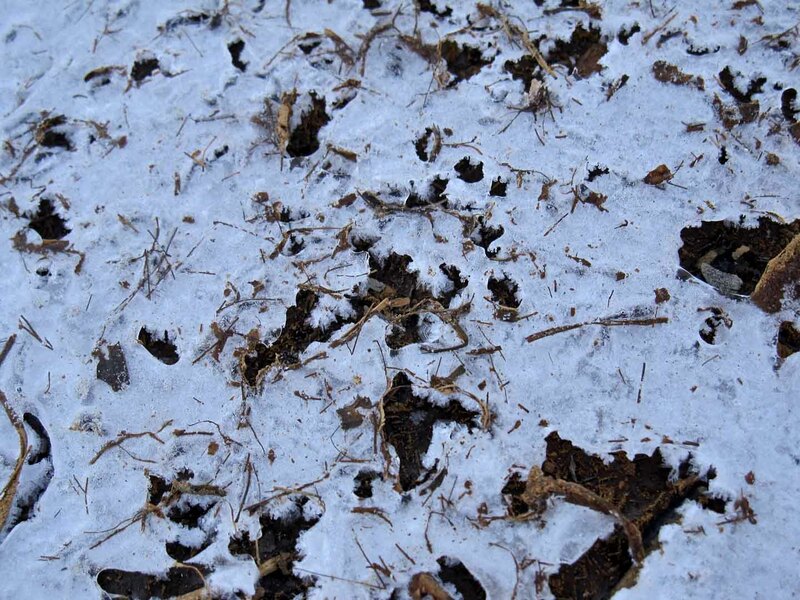 A snow-crystal’s origin lies with some fleck of mineral or organic matter kicked up from the ground. Though most never get far, the occasional bit of dust floats high enough to be caught in a series of updrafts. Upward it floats, cooling all the while, until dew nucleates on its surface. The dust, like the irritant in an oyster that starts the pearl, becomes a miniscule speck, engulfed in a tiny yet growing ball of water – a droplet. This droplet may be as near to a perfect sphere as we are likely to find anywhere. But spherical perfection doesn’t last. I don’t know where to start on this one. For some time I’ve been seeing concentric circular patterns on car windshields and car bodies – bands of white spreading out from a central point like ripples in a pond from a tossed pebble. Typically, they spread outward 3-10 inches or so before meeting up with ripples originating from another spot. When I try to zoom in on the individual crystals, I usually see only vague outlines with the occasional recognizable form. What could cause this pattern? Here's a clue. 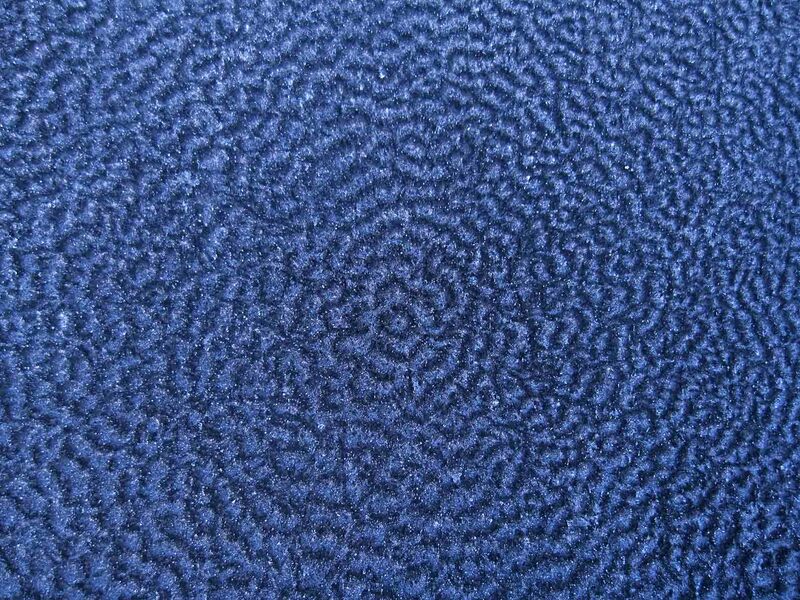 I’ve seen this whirlpool pattern on two mornings on the same plastic side-mirrors of the same car. The hollow columnar crystals are oriented lengthwise along concentric circles, which strongly suggests that an underlying film froze with the same rotating crystal orientation. This is strange. To see why I think it strange, we need to specify crystal direction. Consider the ice-crystal optic axis, the length-wise direction of the columns (or the direction straight into a stellar-star crystal). If we draw the optic axis for each crystal as an arrow, then we would have something like the following picture. When a film of water on a smooth surface like glass or a car roof freezes, the preferred crystal orientation is that with the arrow pointing straight up and out of the surface. So, I find the above pattern mysterious - why don't the arrows have any trend toward pointing upward? Why do all the arrows stay in the same plane? Another mystery is the fact that I’ve seen this same whirlpool pattern with about the same center spot on both side mirrors on more than one morning. 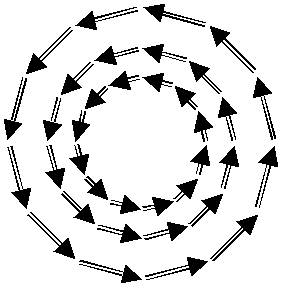 Perhaps the whirlpool pattern arises somehow because the surface is curved. 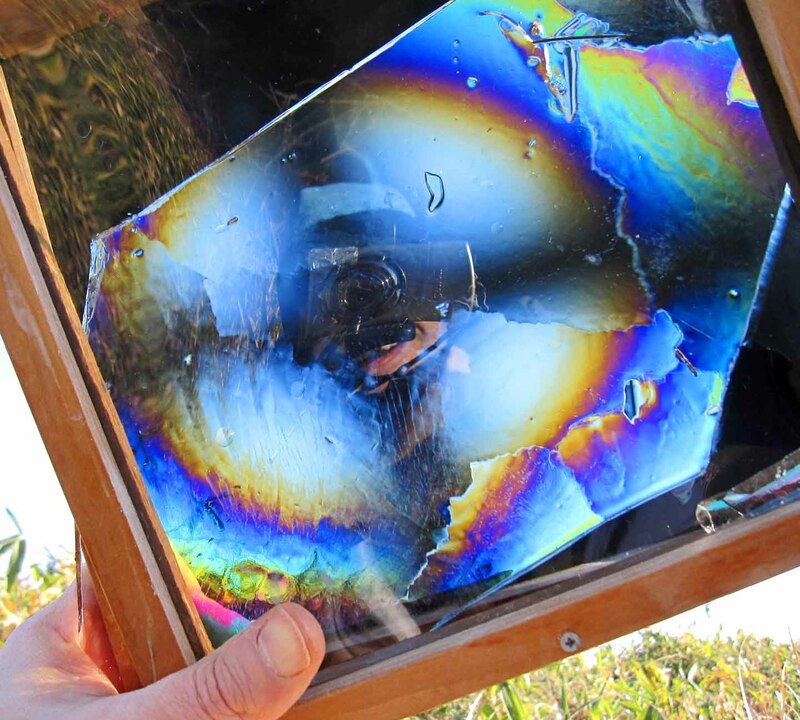 Or maybe films of water on plastic freeze differently than films on smooth metal or glass. For now, I’ll call this the mystery of whirlpool hollows. It often seems like people refer to any kind of ice stuck on something as frost. If one looks in books or the Internet, one can usually find a specific term for the many different and interesting ice formations, but a term used by one group of people generally differs from that used by another. Wouldn’t it be nice for scientists and naturalists (at least) to have some generally universal, agreed-upon way to describe any surface-ice formation? 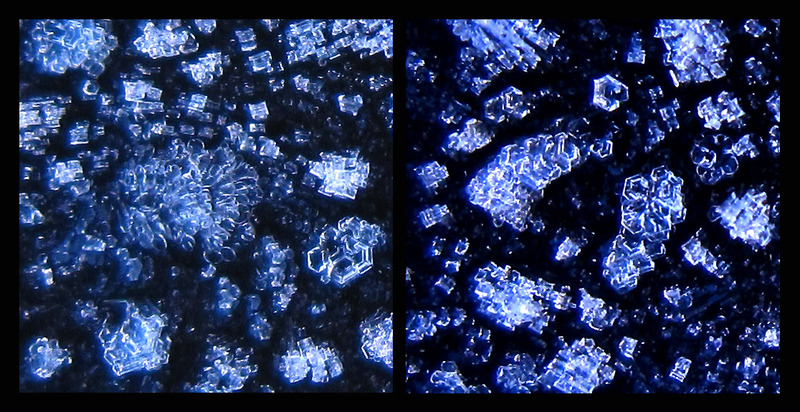 Snow crystals have such a system, so why not surface-ice forms? We could try to establish word-names for each formation, like “frost flower”, but different people are used to using different names for the same thing, and they are unlikely to give up the habit, particularly if they are unfamiliar with the language of the term’s origin. For example, there are several well-used terms for the ice columns in dirt that I discuss in “Ice on the Rocks” including “frost heave”, “needle ice”, "ice columns", and “pipkrake”. But “needles” also names a type of snow. 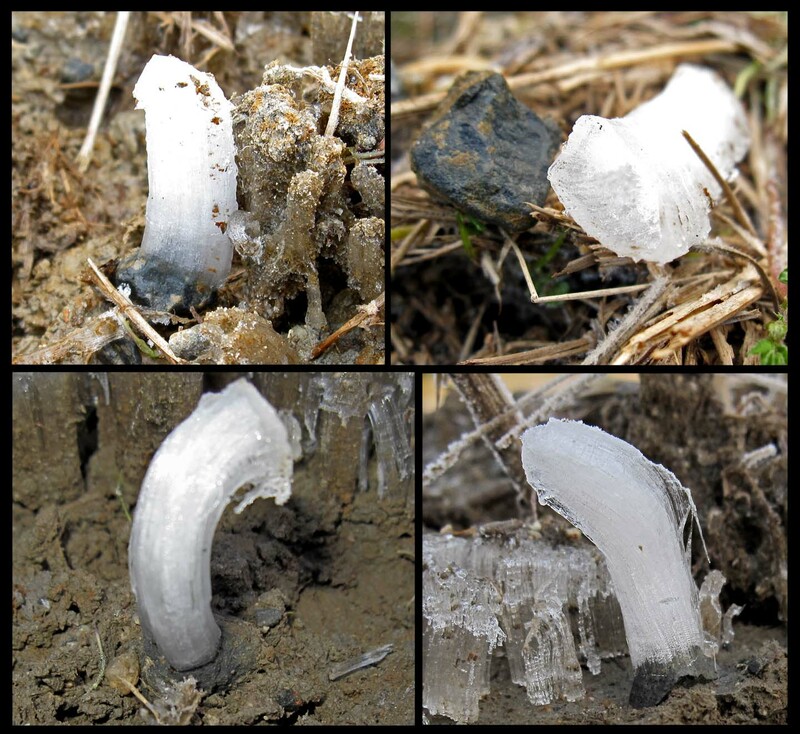 Another example: The white, curly ice hairs that can extrude from plant stems and logs is sometimes called “frost”, “frost flowers”, “Ice flowers”, "needle ice", and “sap crystals”. But the two flower terms are also used for several other, very different things. Though a few terms seem to be used consistently in English, like “hoarfrost” and “icicle”, most aren’t. And probably none work across all languages. So, instead of using word-names, a set of symbols may work best. Wilson Bentley gave a good start to such a universal code for surface ice way back in 1907. 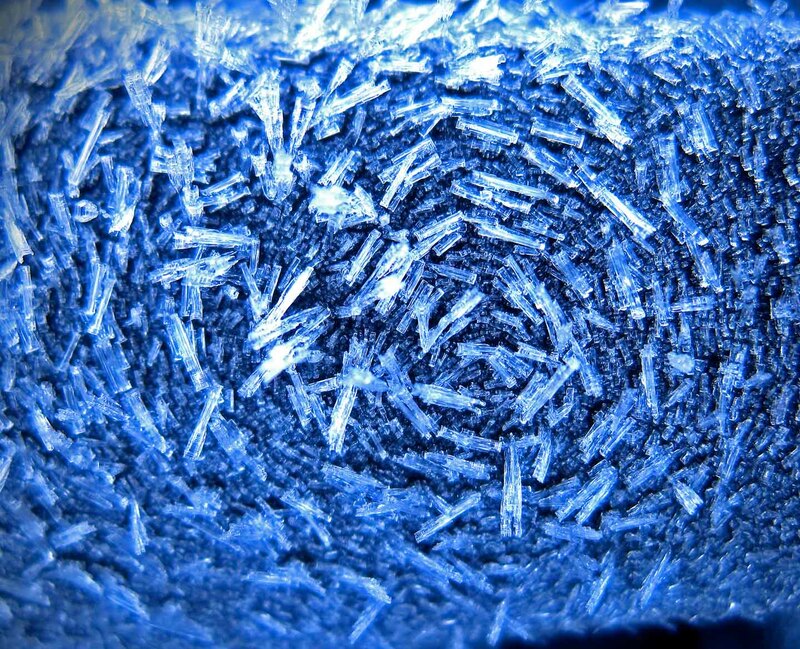 His article “Studies of frost and ice crystals” gave an ingenious method for classifying several types of surface ice . The article is a fantastic source of information about hoarfrost, window-pane frost, and ice that grows in bodies of water like lakes and rivers. Unfortunately, I know of no one except Bentley who ever used his system. This lack of use is probably due to issues unrelated to his system’s merits, so his system might need only a little revision and some promotion to get it into use. My purpose here is to suggest such a revision. Position 1: capital letter giving the kind of frost or place of deposition. Position 2: capital letter giving the characteristic form of the ice. Position 3: capital letter giving how common the ice form is. Position one could be "W" for window frost, "H" for hoarfrost, "I" for window-ice, "M" for massive ice (e.g., ice in puddles, lakes, and rivers), and "S" for hailstones. For short, we could call it the WHIMS system. 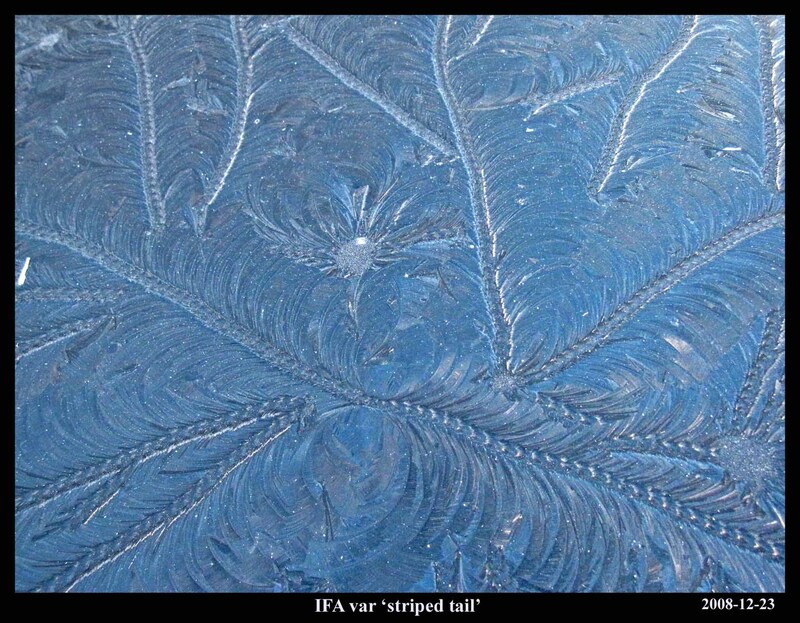 As an example, the following ice formation is “IFA” in his system. Although the “I” stands for window-ice, ice on smooth black metal, as in the above case, has similar growth patterns. This morning it just barely dipped below freezing, the first time in several days. Off I went to the usual black cars. And once again the frost to me looked like things I’d seen before. I decided to take a few pictures anyway, and once again I was surprised at what I saw in the zoomed images. To my eye, the site in the image below looked like small droplets that froze and then grew hoar. With my camera battery running low, I moved on to the tubs and rice fields. On the morning of December 7 of 2008, I saw a small yet distinct white patch on the ground amongst the dirty brown crunchy soil-ice columns in a rice field. If I hadn’t been looking straight at it, I would have missed it. Crouching down and clearing away some of the surrounding dirt-ice columns, I found it to be a white ice column resting on a small pebble, unlike the surrounding brown columns that rested on the soil. You can see this pebble and ice at the upper left in the image below. The white ice “cap” detached easily and cleanly from the pebble (See the above image, upper right). I could put the cap back on the pebble, and it would stay in place, fitting snugly. Though I appreciate seeing the old and familiar, when I venture outside on frosty mornings, I usually see at least three unexpected things. Three unexpected things before breakfast. A few days ago, the frost at first appeared more hoary than curvy, but when I peered over the top of a black SUV, I saw ice curves in the shape of an eye. Just for fun, I put an image of it next to a mirror-reversed copy, to give the following composite. Call it the eyes of frost. Like me, you've probably seen curvy growth before, even if it didn't take the form of an eye. But let's venture into the eye of frost and notice something new: straight-segmented web-like growth. I've never seen that before, and I never expected it. A few days after my encounter with the pawprints and grey muck, one of the ponds did freeze over. After me and my camera spent about 30 minutes admiring this rare event, I went and ruined the complete glaze job by punching a hole in it. Although the top surface had lots of interesting curves and shallow grooves, the underside, only about 8-mm below, was flat and featureless. I suppose this is because the surface marking the melt-line (i.e., 0 degrees C) is flat. But when I put a piece of pond glaze between two polaroid sheets, with one polaroid 'crossed' to the other, I saw an odd sight. The large black "X" that appears here is sometimes called the "Maltese cross". Elizabeth Wood, in her classic little book "Crystals and Light", calls it the "black cross". And when I looked up some cross shapes online, I thought the above figure looked more like the German "iron cross". Anyway, whatever you call it, it doesn't seem to fit the scene. On account of the recent cold spell, I went up the hill behind us in search of a glazed-over pond. Ponds can have interesting freezing patterns and, if the ice is thick enough, a little excitement. I've never seen these ponds freeze, but then again, I've never thought it likely enough to warrant a visit in winter. The first two ponds I visited (technically, man-made reservoirs for flooding the rice fields) had ice only over a small section at one end. I had better luck with with a drained pond. This 'pond' looked more like a dirty mud pit, but I saw evidence of ice on one side. So, ignoring the warning signs (more on that later), I walked down and around to the icy end. From eye-level, and even from a crouch, this ice looked like snow. But except for the holes that exposed the dirt underneath and the twiggy matter on top, the surface was smooth and level, like that of a glazed pond or puddle. Indeed, a partially glazed-over pond is probably what it had been. The whiteness was due to some fuzzy growth underneath that I could see in the large gaps (see the image below).